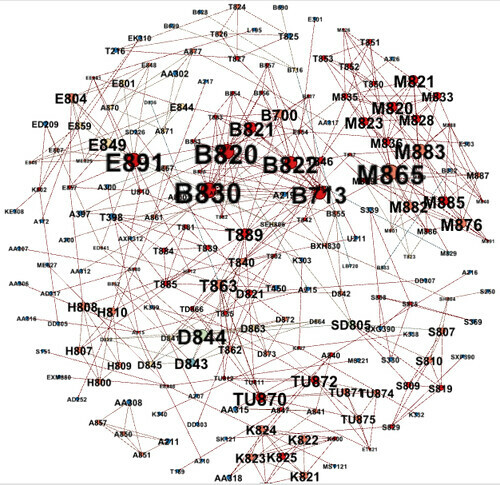 From Linked Data to Linked Applications? We might also optionally specify mount directories with the calling and called containers, using a conventional default otherwise. This got me thinking that the called functions might be viewed as operating in a namespace (psychemedia/contentmine or dockerhub::psychemedia/contentmine, for example). And this in turn got me thinking about “big-L, big-A” Linked Applications. Include a Dockerfile. so that they can discover what the application is built from (also may link to other Dockerfiles). Compared with Linked Data, where the idea is about relating data items one to another, the identifying HTTP URI actually represents the ability to make a call into a functional, execution space. 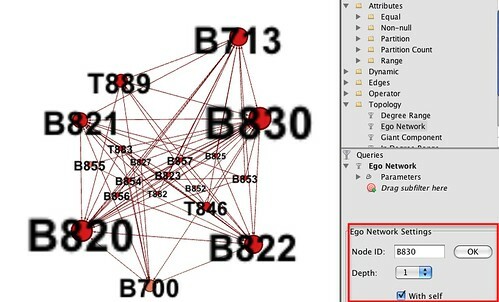 Linkage into the world of linked web resources might be provided through Linked Data relations that specify that a particular resource was generated from an instance of a Linked Application or that the resource can be manipulated by an instance of a particular application. So for example, files linked to on the web might have a relation that identifies the filetype, and the filetype is linked by another relation that says it can be opened in a particular linked application. Another file might link to a description of the workflow that created it, and the individual steps in the workflow might link to function/command identifiers that are linked to linked applications through relations that associate particular functions with a particular linked application. Workflows may be defined generically, and then instantiated within a particular experiment. So for example: load file with particular properties, run FFT on particular columns, save output file becomes instantiated within a particular run of an experiment as load file with this URI, run the FFT command from this linked application on particular columns, save output file with this URI. Hmm… thinks.. there is a huge amount of work already done in the area of automated workflows and workflow execution frameworks/environments for scientific computing. So this is presumably already largely solved? For example, Integrating Containers into Workflows: A Case Study Using Makeflow, Work Queue, and Docker, C. Zheng & D. Thain, 2015 [PDF]? the model I’m exploring in the Docker magic context is essentially stateless/serverless computing approach, where a commandline container is created on demand and treated in a disposable way to just run a particular function before being destroyed; (see also the OpenAPI approach). The Linked Application notion extends to other containerised applications, such as ones that expose an HTML user interface over http that can be accessed via a browser. In such cases, things like WSDL (or WADL; remember WADL?) provided a machine readable formalised way of describing functional resource availability. In the sense that commandline containerised Linked Applications are actually services, we can also think about web services publishing an http API in a similar way? services such as Sandstorm, which have the notion of self-running containerised documents, have the potentially to actually bind a specific document within an interactive execution environment for that document. Hmmm… so how much nonsense is all of the above, then? [T]his post shows how you just need rdflib and Python to build a simple linked data mashup – no separate triplestore is required! 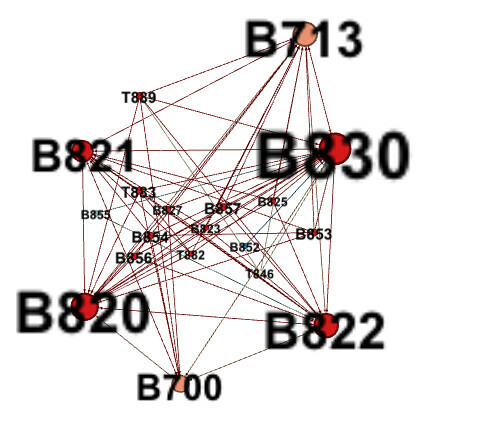 RDF is loaded into a Graph. 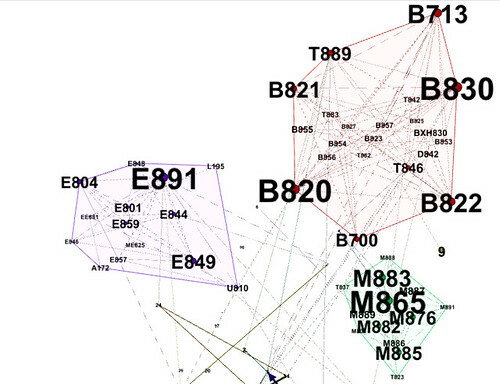 Triples in this Graph reference postcode URIs. 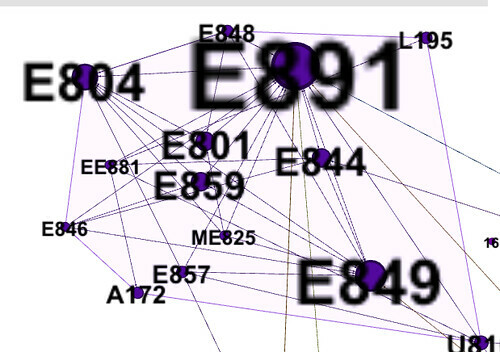 These URIs are de-referenced and the RDF behind them is loaded into the Graph. We have now enhanced the data in the Graph with local authority area information. So as well as knowing the postcode of the organisations taking part in certain projects we now also know which local authority area they are in. Job done! We can now analyse funding data at the level of postcode, local authority area and (as an exercise for the ready) European region. Install an RDF store from a package management system on a computer running either Apple’s OSX or Ubuntu Desktop. Install a code library (again from a package management system) for talking to the RDF store in either PHP, Ruby or Python. Programatically load some real-world data into the RDF datastore using either PHP, Ruby or Python. Programatically retrieve data from the datastore with SPARQL using using either PHP, Ruby or Python. Convert retrieved data into an object or datatype that can be used by the chosen programming language (e.g. a Python dictionary). For what it’s worth, I’ve been looking over some of the programmes that the OU co-produces with the BBC to see what sorts of things we might be able to do in Linked Data space to make appropriate resources usefully discoverable for our students and alumni. With a flurry of recent activity appearing on the wires relating to the OU Business School Alumni group on LinkedIn, the OU’s involvement with business related programming seemed an appropriate place to start: the repeating Radio 4 series The Bottom Line has a comprehensive archive of previous programmes available via iPlayer, and every so often a Money Programme special turns up on BBC2. Though not an OU/BBC co-pro, In Business also has a comprehensive online archive; this may contain the odd case study nugget that could be useful to an MBA student, so provides a handy way of contrasting how we might reuse “pure” BBC resources compared to the OU/BBC co-pros such as The Bottom Line. Top tip [via Tom Scott/@derivadow]: do you know about hack where by [http://.bbc.co.uk]/programmes/$string searches programme titles for $string? So what to do? Here’s a starter for ten: each radio programme page on BBC /programmes seems to have a long, medium and short synposis of the programme as structure data (simply add .json to the end of programme URL to see the JSON representation of the data, .xml for the XML, etc.). If you look at the extracted tags in the left hand sidebar, you’ll see personal names and company names have been extracted, as well as the names of people and their corporate position. 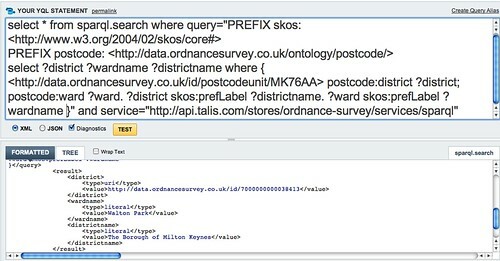 Adding formal identifiers such as these is something I keep hassling Simon Rogers and the @datastore team about, so it’s great to see the use of a presumably standardised identifier there:-) Only – I can’t see how to join it up to any of the other myriad identifiers that seem to exist for council areas? 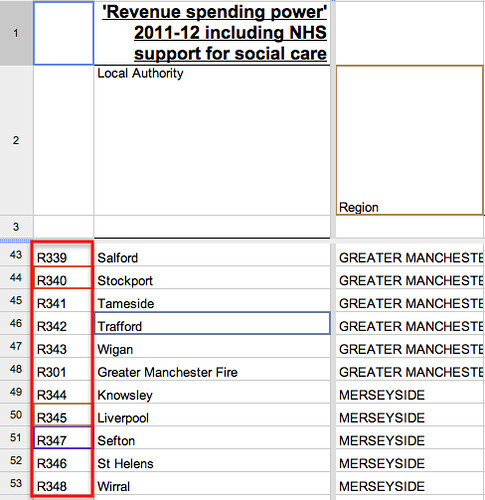 I can google “Trafford R342” and find a couple of other references to this association, but I can’t find a way of linking to entities I know about in the Linked Data world? But then, maybe the R*** areas don’t match any of the administrative areas that are recorded in any of the other data soruces I found…? So I have an identifier, but I don’t know what it actually refers to/links to, and I donlt know how to make use of it? Take for example, the case of counties. 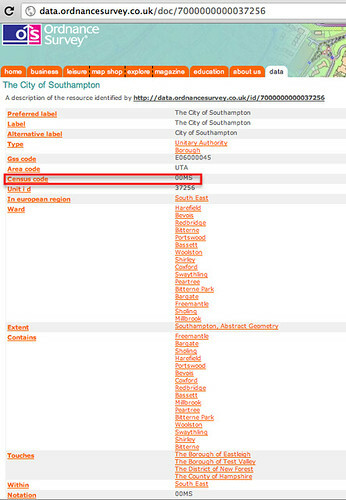 Following a brief Twitter exchange this morning with the ever helpful @gothwin, it turns out that if you live in somewere like Southampton (or another unitary authority or metropolitan district), you don’t live in a county… (for example – compare the Ordnance Survey pages for postcode areas SO16 4GU and EX1 1HD). The notion of counties is apparently just a folk convention now, although the Association of British Counties is trying to “promote awareness of the continuing importance of the 86 historic (or traditional) Counties of Great Britain… contend[ing] that Britain needs a fixed popular geography, one divorced from the ever changing names and areas of local government but, instead, one rooted in history, public understanding and commonly held notions of cultural identity.” Which is why they “seek to fully re-establish the use of the Counties as the standard popular geographical reference frame of Britain and to further encourage their use as a basis for social, sporting and cultural activities”. (@gothwin did hint that OS might be “look[ing] at publishing a ‘people’s geography’ with traditional counties”. 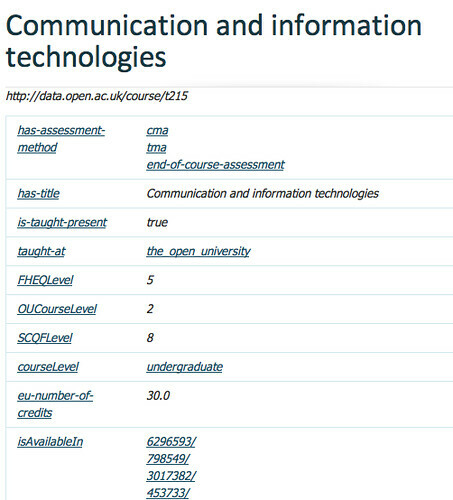 So it was encouraging to see earlier this week an announcement that the OU’s data.open.ac.uk site has started publishing module data from the course catalogue – that is, data about the modules (as we now call them – they used to be called courses) that you can study with the OU. It’s also possible to find modules that bear an isSimilarTo relation to the current module, where isSimilarTo means (I think?) “was also studied by students taking this module”. 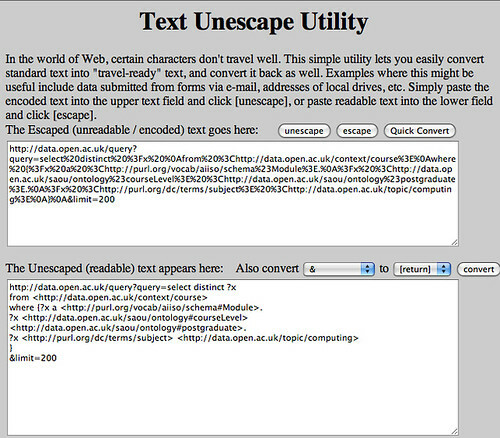 Just by the by, there’s a host of other handy text tools at Text Mechanic. For a couple of weeks now, I’ve been look for an opportunity to try to do something – anything – with the newly released Ordnance Survey Linked Data (read @gothwin’s introduction to it for more details: /location /location /location – exploring Ordnance Survey Linked Data – Part 2). One of the things the OS Linked Data looks exceedingly good for is acting as glue, mapping between different representations for geographical and organisational areas; the data can also return regions that neighbour on a region, which could make for some interesting “next door to each other” ward, district or county level comparisons. <http://data.ordnancesurvey.co.uk/id/postcodeunit/MAGIC_POSTCODE> postcode:district ?district; postcode:ward ?ward. The next thing I wanted to do was use two different Linked Data services. Here’s the setting. 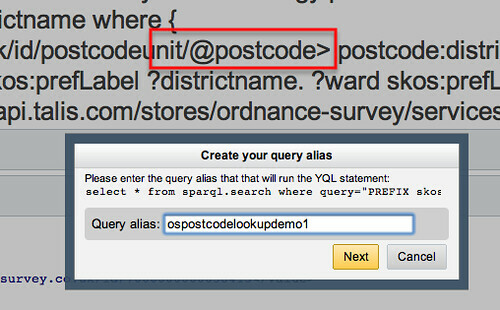 Suppose I know a postcode, and I want to lookup all the secondary schools in the council area that postcode exists in. How do I do that? Here, the secondary schools are being identified according to the district area they are in (00MG in this case). 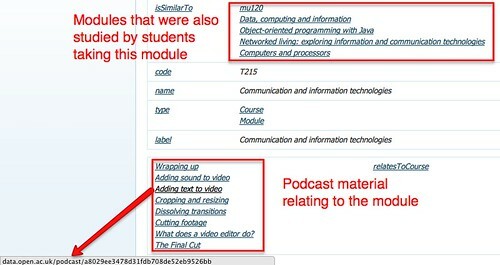 Here’s a Scraperwiki example showing the two separate Linked Data calls chained together (click on the “Edit” tab to see the code). – how to get data from one Linked Data query and use it in another. PS whilst doing a little digging around, I came across some geo-referencing guidance on the National Statistcics website that suggests that postcode areas might change over time (they also publish current and previous postcode info). 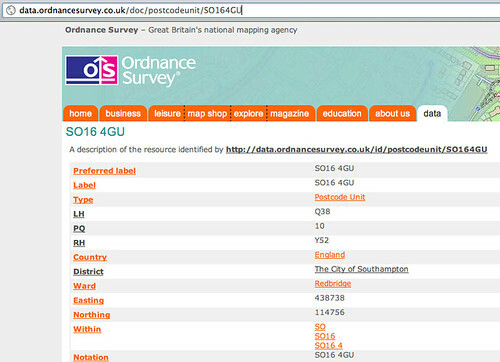 So what do we assume about the status (currency, validity) of the Ordnance Survey postcode data? Over the last few weeks, there has a been a smattering of challenges to the Linked Data community baiting them to demonstrate some of the utility of the Linked Data approach (e.g. A Challenge To Linked Data Developers (followed up in Response To My Linked Data Challenge) and Linked Data: my challenge, with some other possibilities here: 10 Ideas For Web of Data Apps). 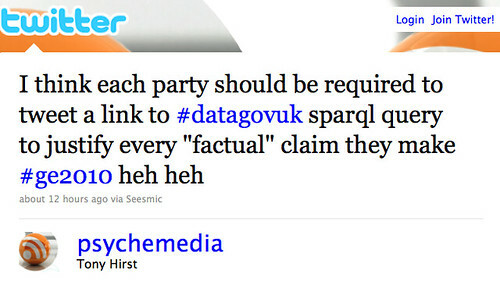 That is: each party should be required to tweet a link to #datagovuk sparql query to justify every “factual” claim they make. 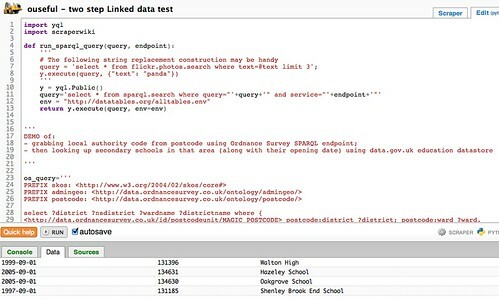 For example – can someone write me a Linked Data query to show how much is spent by the government on UK education quangoes?